Bits of My Own: Old Aviary Part 3 is Finished! Old Aviary Part 3 is Finished! Finally part 3 is finished! What a pleasure it is to work in color! 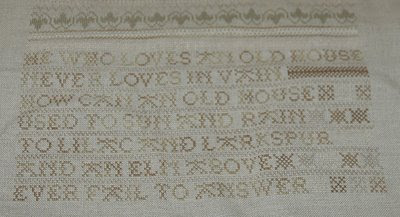 I apologize in advance for the pictures I really think the reason I have been posting more, is the trouble I have getting good pictures of this sampler. Click on the pictures for better view. I am moving right along on part 4, but I am a little afraid that I will not have enough of one of the colors to finish. Oh, I hope it makes it. Otherwise it will be the third time I will have to go back to Vicki Clayton to request more. The thread package was supposed to be enough for the whole sampler, but something went wrong somewhere along the line. It is a little stressful worrying if you will have enough to finish. Thank you to all of you who have left comments or emails. It is really nice to know there are so many nice people out there! About the bees: All of the hives are a little weak due to all the rain. (I swear it rains every day here in NY)! The bees do not come out in the rain or on very cloudy days, so they have not been too successful making honey. We are watching closely the damaged hive. We still do not know if they were able to make a new queen. It will be another 10 or 12 days before we know for sure. Even though I have not been posting regularly, I have been reading your blogs every day. They are positively inspiring! 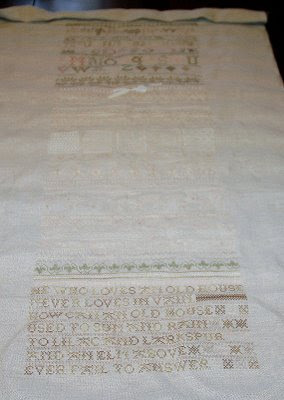 This sampler is really gorgeous! Thanks for the bees update too - I hope the damaged hive will be OK in the end. Love the sampler...I was so sad to read about the bees! MAD too! I am hoping that they get whats coming to them! (The vindictive (enter bad name here!) not the bees! lol...happy stitching! Oh my, WOW! This is lovely! 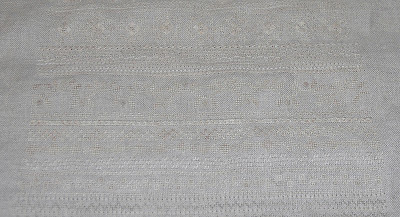 All that whitework is just stunning! Wow! This is really looking beautiful! I hate it when you run short on fibers...such a bummer to have to chase them around! wow! how many hours have you put into that??!! it is looking great! Your sampler is looking amazing! Fingers crossed that the bees pull through. That's a big design and progress is looking great. It is just amazing, so beautiful! Old Aviary Update and Thanks!